In December 2015, an outbreak of bovine Tuberculosis (TB) infected four herds of deer and cattle in the Mt. Cargill area, on the outskirts of Dunedin, New Zealand. Needless to say, the news was not welcomed. After reaching peak levels in the 1990s, a large-scale $1.2 billion control effort had brought bTB affected herds down from 1700 in 1998 to only 41 in 2015. OSPRI manages two programmes, NAIT and TBfree, for the purpose of enhancing the reputation of New Zealand's primary industries. National Animal Identification and Tracing (NAIT) captures data to trace individual animal movements of cattle and deer across the country to maintain an animal record from "gate to plate". TBfree is a national effort to reduce and eradicate TB from New Zealand's cattle and deer populations. OSPRI uses a combination of herd Tb testing, controls on animal movement for infected herds, and survey and control of wild animals to eradicate TB from an area once an outbreak is identified like at Mt. Cargill. The need for accurate landcover information is a vital component of the TBfree programme. By using remotely sensed data, OSPRI is able to determine possum habitat and efficiently target control efforts without wasting time and resources scouting or controlling an area that would not have adequate habitat to sustain a large enough wildlife population to spread disease. 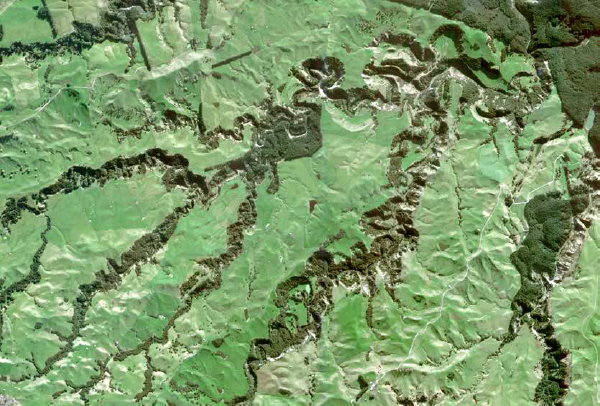 Accurate landcover data gives OSPRI an up-to-date view so contractors can accurately price ground control operations and can then reliably audit the trapping. ENVI proved an invaluable asset in both the manual processing as well as the supervised classification work. Numerous sets of vegetation index data were produced to help inform any manual processing, and the supervised classification workflow simplified what would otherwise be a lengthy task. OSPRI was able to produce accurate landcover maps for contractors for a large portion of the ground based pest management programme for 2015/2016, which reduced the level of uncertainty towards project aims and allowed for accurate auditing at the end of each project. With the exception of the processing conducted by Digital Globe, this process was repeated for the 2016/2017 financial year and was recently used in conjunction with urgently acquired WorldView-2 imagery to produce landcover data around the infection incident in the Mt. Cargill area.